As a child, Little Critter was my favorite, we have so many of these books and I plan on using them in my future classroom. 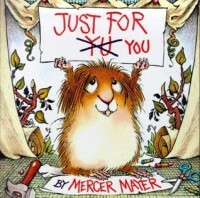 I love how each book teaches a different lesson whether its about saying your sorry or keeping your room clean, there is probably a Little Critter book for the lesson you are trying to teach. Last year with my preschoolers during "all about me" week I used these books and brushed off my layout skills from my journalism degree and created a "Little Critter Life Lessons" book and I pulled different themes from Little Critter books as a way to establish beginning of the year routines and expectations for our class. I think if I was in a kindergarten or first grade class, I would modify my life lessons book to be an emergent reader and use it again to help teach routines and expectations.